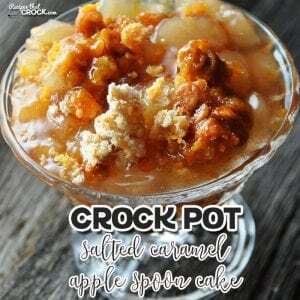 Crock Pot Salted Caramel Apple Spoon Cake - Recipes That Crock! Salted caramel and apple were two flavors that were made for each other, so I couldn’t help but make a Crock Pot Salted Caramel Apple Spoon Cake! A friend of mine was over with her kiddos and mentioned that she had tried an awesome Caramel Apple Dump Cake. I was intrigued, but didn’t think to get the recipe while she was here. I tried to get ahold of her before making this recipe, but when you are a busy momma of three, you can’t always answer your phone. I thought it sounded easy enough that I could put together a recipe for it, so I gave it a try…and boy do I have a treat for you! 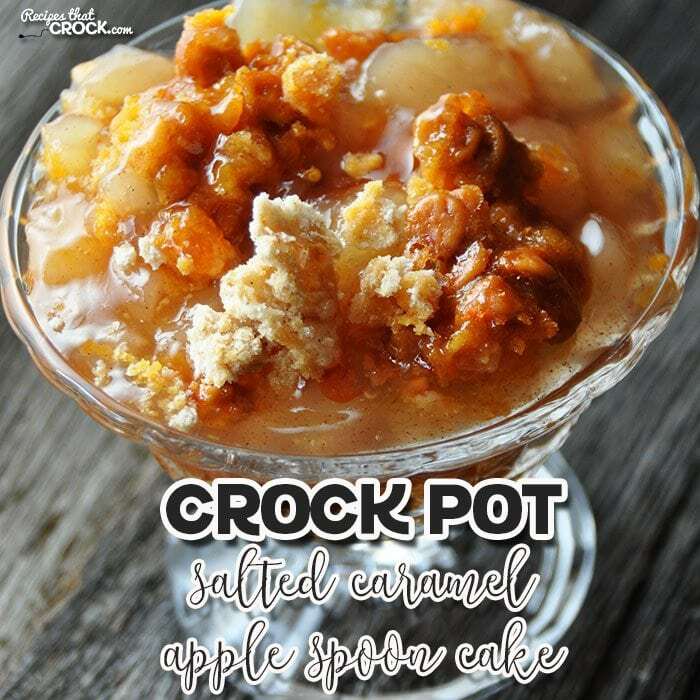 This Crock Pot Salted Caramel Apple Spoon Cake is a really simple recipe. It can be thrown together in less than 5 minutes and is done in around a couple hours! So if you are just starting out using your crock pot, this would be a great recipe to try. If you are an old pro, you will enjoy that this recipe takes no time at all! Do you have fresh apples sitting around and want to use those instead of a can of apple pie filling? You are in luck! 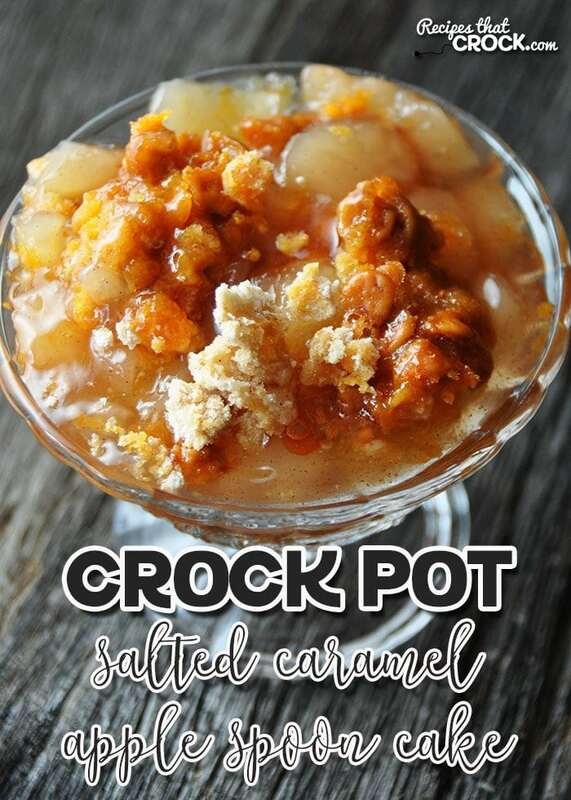 Cris made up this yummy Homemade Apple Pie Filling in her crock pot! My store had salted caramel bits in the baking aisle. If your grocery store only has regular caramel bits, that will work too. Since this is a cake in a crock pot, you will want to fold up 6-8 paper towels and put them under your lid to keep the moisture that gathers on the lid from dripping down on to your cake. Sir Hamilton (my Hamilton Beach Programmable Insulated Slow Cooker) was already in use for this yummy Crock Pot Chicken Noodle Soup, so I pulled out good ol’ Cera (my 6 Quart Crock Pot with Ceramic Coated Pot). I find that using a 6-quart crock pot for cakes gives it the room to rise and cooks it through to the center really well. There are a few cakes where Cassie (my 9 x13 casserole slow cooker made by Crock Pot) has done really well, but I have also had a lot of flops with cakes in the casserole crock, so I usually just start out with one of my 6-quart crock pots. This Crock Pot Salted Caramel Apple Cake is so simple and the perfect recipe for a yummy night in or to take to a potluck! I pulled out good ol’ Cera (my 6 Quart Crock Pot with Ceramic Coated Pot). I find that using a 6-quart crock pot for cakes gives it the room to rise and cooks it through to the center really well. There are a few cakes where Cassie (my 9 x13 casserole slow cooker made by Crock Pot) has done really well, but I have also had a lot of flops with cakes in the casserole crock, so I usually just start out with one of my 6-quart crock pots. I have another question. Can you use the crockpot bags on this recipe. It would make it a lot easier to clean up. If I would’ve had some liners, I always seem to run out, I would have used one since Sir Hamilton was already in use. However, Cera cleaned up pretty easily. I’m all for the easiest clean up though, so even though I haven’t tried it on this recipe, I don’t see why it wouldn’t be a great way to make this with little clean up! Enjoy! This recipe is very similar to one my husband uses for Dutch oven cobbler except we add a can of regular sprite to activate the baking powder. We need to try this out on our empty nester group. I tried this recipe out a few times and found that putting the butter around the edges only seemed to work best. I have not tried it with a spice cake yet, but I do use a spice cake in Gramma’s Crock Pot Apple Spice Dump Cake. (Recipe link below) You might like that! Enjoy! Where can you find salted Caramel bits? They will be in the baking aisle, right next to the chocolate chip varieties used for baking. Enjoy! I did find the recipe for fresh apple filling. Thank you. What are the salted caramel bits, are they found in the baking aisle with the chocolate chips? You are correct! The salted caramel bits will be right by the chocolate chips. Enjoy! How can I make half this recipe? I have never tried making half of this recipe, but if I did, I would follow the same steps in the recipe above. You would only need one can of pie filling and 2 tablespoons of butter. The cake mix and caramel bits would be the trickier part. I would measure out the entire cake mix in a large measuring cup and use half. Do the same with your bag of caramel bits. You will also want to use a smaller crock pot and watch it very closely the first time you make it to see how the cooking time might need to adjust. Enjoy! could I try this recipe using my new Inst-Pot and pressure the apple filling recipe for 20-30 min? And even .perhaps cooking the whole apple cake in the Insta-Pot? SallyRan. I have not tried this in an InstaPot, however, if you do, let me know how it goes! Enjoy! What is the recipe for using fresh apples?? I would like to try this recipe but I don’t like store bought pie filling. In the notes section above, I have a link to Cris’ Homemade Apple Pie Filling for those who don’t want to use store bought pie filling. It is a great time of year to use fresh apples! Just use the pie filling you make in place of the can I mention in the recipe, and you are good to go! Enjoy! I bet you can use mini chocolate chips. Also adding some brown crunchie sugar.just a quarter of cup. What could be bad? Those are some great ideas! Let me know how it turns out if you give it a try. Enjoy! Do you make the cake mix according to the directions on the box or simply put the powder mix in? You just sprinkle in the powder mix in! Doesn’t get must easier than this! Enjoy! I would like to double the recipe as well as Jenny above to bring to my office. Would I need to increase the cooking time? I would make two cakes in two different crock pots. If you increased the cooking time to accommodate the double batch, I am afraid the edges might burn before the center would get done. Enjoy! I need to double this recipe…will it fit in a 6-quart crock pot? It looks amazing! If you need it doubled, I would make two separate cakes in two different crock pots. I am afraid doubling it up would make it hard for the center to get done. Enjoy! Bet it would be good with pecans added…..
Great idea! Let me know how it goes if you try it! Enjoy! No need to apologize! We are here to help! I’d hate to guess how many questions I asked when I first started! You will take your paper towels and make a stack that will lay on top of the crock/insert, without touching the food, and place your lid on top. Your paper towels will catch all of the condensation that drips from the lid so that it doesn’t end up in your cake. Enjoy! Thank you for that answer, Ive been using a crockpot for years, I have 3 of them all different sizes, I only tried to make a cake once and it turned out horrible but now I know why, the paper towel trick, did not know that so will be trying this one tonight.